Dan is the creator of BladeReviews.com. He founded the site in 2010, and for the first 5 years Dan wrote all of the reviews and recorded all of the video reviews. He grew up using pocket knives, and the decision to start the website stemmed from his fascination of all things sharp combined with a deep passion for writing. At this point he has personally reviewed almost 300 knives of all shapes, sizes, and price points. He is widely recognized as an authority on daily carry knives and has consulted with knife companies on product design and has been featured on national media outlets including the WireCutter. In 2016 Dan decided to branch out and experiment with the website by reviewing watches, flashlights, and multi-tools. Today BladeReviews.com features a number of expert authors reviewing a wide range of daily carry gear. He is proud to write detailed long format reviews with original photography. The website remains largely independent with the vast majority of the products reviewed being purchased by Dan personally. When he isn't writing knife reviews from his home in Southwest Florida, or talking about himself in third person, he enjoys practicing law, reading, fishing, cigars, and weight lifting. At this point he has personally reviewed almost 300 knives of all shapes, sizes, and price points. He is widely recognized as an authority on daily carry knives. He has consulted with knife companies on product design and his opinions on pocket knives have been featured on national media outlets including the WireCutter. In 2016 Dan decided to branch out and experiment with the website by reviewing watches, flashlights, and multi-tools. Today BladeReviews.com features a number of expert authors reviewing a wide range of daily carry gear. He is proud to write detailed long format reviews with original photography. The website remains largely independent with the vast majority of the products reviewed being purchased by Dan personally. When he isn't writing knife reviews from his home in Southwest Florida, or talking about himself in third person, he enjoys practicing law, reading, fishing, cigars, and weight lifting. One visitor to the site commented that we are “a little biased towards Spyderco”. It’s probably because we have reviewed a lot of Spyderco knives over the years. More than any other brand. 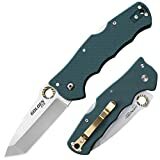 I like Spydercos and so does Ben, Grayson, Josh, and pretty much everyone who has written for the site. We all like their knives and consequently Spyderco has gotten a ton of air time over the years. If reviewing Spyderco knives is wrong, then I don’t want to be right. Perhaps more controversial is my attraction to Cold Steel Knives. I have reviewed a bunch of them over the years. I’m a big fan, although most of them are too big and impractical for me to truly carry and use. I think I may have a fetish because none of the other authors appear to share the desire to review C.S. stuff. Ben reviewed the Large Espada and the Pro-Lite, so I suspect he may also have a little Lynn Thompson in him, and Chad reviewed the Kudu, but that’s it. Me? I’ve reviewed 15 Cold Steel knives. 16 if you include this Golden Eye. Yeah… that’s an addiction. I blame it mostly on their excellent marketing videos. Also Cold Steel keeps coming out with stuff I want to review. Andrew Demko keeps turning out hits, and I keep buying them. The Golden Eye is no exception. It looked cool, and slightly different from the other Cold Steel knives with it’s golden thumb hole. Had to have it. Sorry (not sorry). For some reason I thought the Golden Eye would be smaller. Maybe that’s because Tony wrote a quick review on it a few years back, and he typically picks out smaller more practical knives. Who knows. This is not a small knife. It has an overall length of 8.375″, a 3.5″ blade, and weighs 4.3 ounces. It’s made in Taiwan like most of Cold Steel’s other folders. This is a bigger knife. The handle in particular is pretty large, but that’s OK as we will soon learn it is comfortable. That said, it feels light for its size and will make a great work knife. Not a great urban EDC option. The blade is a big beautiful drop point. The overall profile reminds me of the Terzoula Slipit with its angled thumb ramp extending into a swedged drop point blade. It’s the kind of no-nonsense blade shape that will serve you well in virtually any task. The blade is ground thin with a deep hollow grind, has been given a two-tone satin finish, and is finished with a neat and evenly applied edge. Cold Steel selected S35VN for this knife. These days the vast majority of their premium folders come in S35VN, replacing CTS-XHP, which replaced AUS-8. S35VN should need little introduction at this point. It is an American made steel designed as a follow up to S30V. It is specifically formulated for knife steels and is great stuff. It takes a good edge, has good edge retention, doesn’t rust or stain easily, finishes nicely, is reasonably tough, yet is easy to sharpen. It’s an excellent blade steel. And the S35VN really sings on the Golden Eye. I was borderline shocked with how well this knife performed. It slices cardboard with aplomb. It absolutely zips through the stuff. No issues with rope. Great for slicing fruit and other work in the kitchen as well. This is a sturdy knife but it’s ground to slice and has performed phenomenally well in my use and testing. I’ve been touching up the Golden Eye on my Spyderco Golden Stone, and the edge stays freaky sharp that way. Must be all the gold. No complaints with the blade or blade steel on this knife. The Golden Eye uses Cold Steel’s tried n’ true method of thick linerless G-10 handle scales. I’ve reviewed many of their knives with similar construction, and this knife works just as well as the others. The G-10 is thick and sturdy. There is very little flex when you try to squeeze the handle slabs together. Fit and finish on the handle is excellent. Everything has been neatly finished. The parts are all flush and the handle screws together so the knife can be taken apart and maintained. The choice of forest green for the handles is a nice touch. It’s a little different without being too far out there, and contrasts with the gold hardware. I wasn’t sure how the ergonomics would be on the Golden Eye. I guess that’s true for every knife I order, but the Golden Eye in particular had me guessing thanks to the multiple finger scallops. Complicated finger grooves can be a mistake if they force your hand into an awkward position. Here the groves are generous. They feel comfortable and work well for me. I think that most people will find this knife comfortable to use, but I haven’t taken a poll on this. Let me know in the comments section if you have this knife but don’t like the way it feels in hand. Personally, I’m a fan. In addition to the finger grooves you have peel ply G10 for grip, and some light jimping along the back of the handle. These features provide a good amount of texture without going over the top. Overall I find this to be a comfortable knife to hold in forward and reverse grips. I’ve used this knife extensively and find it to be comfortable to cut with. The Golden Eye comes with a large gold colored pocket clip and is configured for ambidextrous tip up carry. The clip appears to be designed for strength. You have milled recesses in the handle for the clip along with 3 screws. Spring strength is excellent and the knife is kept firmly in place. In the pocket the Golden Eye carries well for what it is. It’s a bigger knife, so I tend to notice it, but it’s also a thin handled knife and it’s relatively light for its size. Not a boat anchor, but not a feather either. The strong clip keeps the knife firmly in place. All said I think the Golden Eye behaves nicely in the pocket for a larger knife. This knife uses a stepped thumb hole to get the blade open. Cold Steel calls this the “Hollow Thumb Ramp” (HTR), and that acronym is pretty accurate. In practice the HTR works well and is a cool idea. It’s kind of a hybrid between a thumb hole and thumb stud. There is a lot for your thumb to grab onto, and this knife can be opened with gloves as well. The serrated thumb hole is held in place with a set screw, which is kind of interesting. It’s a nice design and one I wouldn’t mind seeing on more knives. It’s worth noting that the gold plating on the thumb hole has worn off. I bought this knife off BladeForums in “Like New” condition, and it clearly was not like new. Disappointing, but given the price I paid and the fact I was going to use this knife I ultimately decided to keep it. However, the pictures you see here demonstrate that the gold finish is subject to wear. The action of this knife is smooth thanks to a large pivot and phosphor bronze washers. Like most Cold Steel Tri-Ad lock knives, a good amount of force is required to open and shut the blade. This isn’t a blade you will be able to flick open. 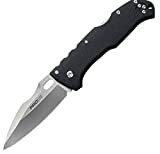 But you will find the action to be smooth and reliable, and that’s what I would expect from a rugged utility knife like this. For lockup we have the aforementioned Tri-Ad lock. I’ve reviewed a dozen or so knives featuring this knife of lock, so forgive me if this sounds a little repetitive, but the Tri-Ad lock is a lock back reinforced with a stop pin. It’s an extremely strong lock design. The Tri-ad lock on the Golden Eye knife is no exception. You can’t muscle blade play out of this even if you try to move the blade out at the tip. Disengaging the lock requires a good amount of force, but it’s not as bad as something like the 4-Max. Actually, I find the amount of effort it takes to open and close this knife to be reasonable. That said, this knife has been used quite a bit. Out of the box these can be stiff to open and close, so you may need to break your knife in. Cold Steel has done it again. This is a strong and practical utility knife. It handles well, cuts like a beast, and features the strongest lock on the market. The “Golden Eye” (Hollow Thumb Ramp) works great. The HTR combined with the unique profile, gold hardware, and green handles help distinguish this knife in Cold Steel’s lineup. With so many great Demko designs on Cold Steel’s roster you would think that they cannibalize each other. The Golden Eye is a unique knife, even if it follows Cold Steel’s formula in many ways. Where the knife may fall short is that this is another large folding knife from Cold Steel. It’s a great performer if you can carry and use this knife, but this isn’t a knife I can pull out at the office or the grocery store. It’s just too big. If I worked on a ranch or something this would be a great choice, but as a mild-mannered couch commando I usually carry a smaller knife. Also, the finger scallops in the handle won’t work for everyone. That said, I found this to be an impressive knife. Especially the way it cuts. It’s a joy to cut things with this knife. Andrew Demko knows what he is doing and Cold Steel has a track record of executing his designs to brilliant standards. The Golden Eye is no different. Well worth seeking out if you like the design or are an unabashed Cold Steel fan like me. If you are thinking of buying Cold Steel Golden Eye, please consider purchasing it at Amazon or BladeHQ. By purchasing things through any of the links on this website you support BladeReviews.com and help produce future reviews. Thank you very much.